Broken Hill is located near the border with South Australia on the crossing of the Barrier Highway (A32) and the Silver City Highway (B79), in the Barrier Range. It is 315 m (1,033 ft) above sea level, with a hot desert climate, an average rainfall of 235 mm (9 in). The closest major city is Adelaide, the capital of South Australia, which is more than 500 km (311 mi) to the southwest and linked via route A32. Broken Hill's massive orebody, which formed about 1,800 million years ago, has proved to be among the world's largest silver–lead–zinc mineral deposits. The orebody is shaped like a boomerang plunging into the earth at its ends and outcropping in the centre. The protruding tip of the orebody stood out as a jagged rocky ridge amongst undulating plain country on either side. This was known as the broken hill by early pastoralists. Miners called the ore body the Line of Lode. A unique mineral recently identified from Broken Hill has been named Nyholmite  after one of the city's famous sons Ron Nyholm (1917–1971). Lead with the isotope signature of the Broken Hill deposits has been found across the entire continent of Antarctica in ice cores dating back to the late nineteenth century. 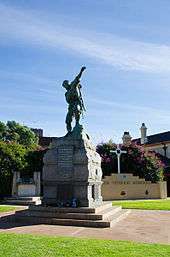 In 1918 the Italian Ambassador to Australia, Emilio Eles, with the help of the Australian police and the army, organized the roundup of Italian deserters working there as miners, to be forcibly sent back to Italy to fight in the war. In 1919, a 1,435 mm (4 ft 8 1⁄2 in) standard gauge rail link from Broken Hill to Menindee was opened as the first stage in a planned direct route to Sydney. The terminus for the train was at Crystal Street station, some distance from the Silverton Tramway Company's Sulphide Street station. The railway mainly hauled water from the Darling River. The rolling stock all had to be transported by sea to South Australia and the railway was supervised by the superintendent of the Broken Hill Tramways. 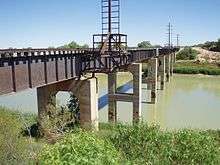 In 1970 the 1,067 mm (3 ft 6 in) gauge railway from Port Pirie to Broken Hill was converted to 1,435 mm (4 ft 8 1⁄2 in) gauge, thus completing the standard transcontinental gauge line from Sydney to Perth. Broken Hill is one of the stops of the Indian Pacific passenger service, operated by the Great Southern Rail, from Sydney in to Perth in via Adelaide. The weekly NSW TrainLink Outback Xplorer service which was introduced in 1996, arrives from Sydney on Mondays at 19:10, departing Broken Hill on Tuesdays at 07:45 for the return to Sydney. NSW TrainLink also operates a daily road coach service, departing the Broken Hill Tourist Information Centre at 3:45, connecting at Dubbo with the Central West XPT to Sydney. The return journey arrives daily at 22:45. By the 1920s most of the nine mines on the Line of Lode had their own steam powered electrical generators to power the surface and underground workings. As Broken Hill is in a desert with little water and virtually no fuel, steam generation was an expensive option. In 1927 a plan for a central power generating facility was proposed by F. J. Mars, consulting electrical engineer with the Central Mine. The proposed powerhouse would provide electricity and compressed air. The mines agreed and formed Western New South Wales Electric Power Pty. Ltd. to construct and operate the plant. The Sulzer diesel powered plant was completed in 1931. This was one of the earliest examples of the use of diesel power generation in Australia. The plant was enlarged in 1950 to cope with increased demand from the North Mine. At the same time, a new power station run by the Southern Power Corporation (owned by Consolidated Zinc) was erected near the New Broken Hill Consolidated Mine to provide power to the southern end of the Line of Lode. Both stations were connected to a common grid that serviced the mines on the Line of Lode. A HVDC back-to-back station with a maximum transmission rate of 40 megawatts was built at Broken Hill in 1986, to draw from the National Grid. It consists of 2 static inverters working with a voltage of 8.33 kV. After this station was operational, the two other power stations closed and the equipment was gradually removed from the Central Power Station. The mothballed Southern Power Station, now owned by remnant miner Perilya, still houses five, 9 cylinder, Nordberg marine engines and two Mirrlees V16 marine engines. In 2010, the Central Power Station (CPS) buildings were handed back to Broken Hill City Council for a proposed re-development as a Film Studio, due the perceived need for a facility in Broken Hill by some local people. The historic machinery was all removed and presumably scrapped and the giant pits that the motors were housed in were filled with concrete to convert the buildings into a warehouse type layout. The Broken Hill City Council has received considerable funding and spent a large amount of money and resources on establishing a film studio in the buildings but as at late 2014 these buildings remain largely empty and unused. 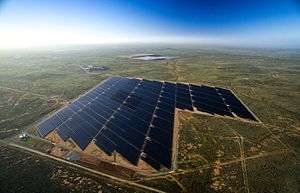 The high potential for solar power given the extensive daily hours of sunshine in the town necessitated the Broken Hill Solar Plant to be constructed as Australia moves away from coal generated power in favour of renewable energy. The plant was completed in 2015 and is one of the largest in Australia. Broken Hill has never had a permanent local water supply which meets the town's needs. By 1888 when the town's population had reached 5,000, the state government built a series of small storage tanks. By the 1890s, mining development had increased to the point that there was a severe water shortage and the mines and the people fought for water. Emergency water supplies were shipped by rail from the Darling River. In 1891, the Stephens Creek Reservoir was completed by a private company. The cost of water was high but not excessive and people were willing to pay because the environment was arid. Another reservoir was built at Umberumberka, however variable rainfall meant supplemental supplies by rail and rationing was still needed. In 1952, Broken Hill's demands for a permanent water supply were met with the completion of a 61 cm (24 in) pipeline from Menindee. The pipeline can supply 1.6 megalitres of water per hour. Water storage facilities that are part of the Menindee Lakes Scheme on the Darling River, have secured water supply to Broken Hill, making it a relative oasis amid the harsh climate of the Australian outback. High evaporation rates have resulted in the policy of using the local storages for supply before using the pipeline. In 2004, due to severe drought across much of the Murray Darling Basin Catchment area the Darling River ceased to flow and the Menindee Lakes dried out, Broken Hill essentially ran out of water, with a muddy sludge coming out of some taps around Christmas time in 2004. The high salt content of the water led to a lot of damage to evaporative air conditioners and rusted out hot water systems at an alarming rate. In 2014, due to mismanagement of the Menindee Lakes scheme and contributing drought conditions in the upper catchment the Menindee Lakes are all but dry once again. This time the NSW State Government is exploring the establishment of Bore Water from underground aquifers to be used as a back up emergency supply for the town of Broken Hill. The local people are protesting this proposal with various public meetings and social media forums being held to protest the plan. Broken Hill has a hot desert climate (BWh) under the Köppen climate classification. Winters in Broken Hill are relatively mild and dry, while summers are highly variable — mostly hot and dry with some variation (summer storms with high humidity are not uncommon). The average maximum during the summer months (November to March) is about 32 °C (90 °F) with an average of 25% humidity, although occasional rainfall and cooler weather occur. Broken Hill gets 157.3 clear days, annually. Dust storms are a common problem in the desert, but in the late 1930s the people of Broken Hill, led by Mr Keast of the Zinc Corporation mine, created green reserves to surround the town thus protecting it from the worst of the storms. Dewpoints in the summer average between 7.5 and 10 °C (45.5 and 50.0 °F). The Broken Earth Restaurant is situated on top of mullock heaps and provides panoramic views of the town. Broken Hill has been and still is a town dominated by the mining industry. The mines founded on the Broken Hill Ore Deposit – the world's richest lead-zinc ore body – have until recently provided the majority of direct employment and indirect employment in the city. The Broken Hill Proprietary Company became Australia's largest mining company, and later became part of the world's largest mining company, BHP Billiton. Before the 1940s, mining was done by hand tools with high labor usage rates and included horse-drawn carts underground. The advent of diesel powered mining equipment in the late 1940s and the move toward mechanised underground mining has resulted in less labor used per tonne of ore recovered, and the mine workforce has declined. Another factor in the shrinking of the workforce has been the consolidation of mining leases and operators from several dozen to just two main operators at present. While the low metal prices of the 1990s led to the failure of miner Pasminco Ltd, the recent resurgence in metal prices has returned the sole existing operator, Perilya Limited, to profitability and prompted Consolidated Broken Hill Limited to advance development of the untouched Western Lodes and Centenary Lodes. This created over 70 jobs during development and will lead to a second, new, milling operation built within the town. Although the mining industry is resurgent, labor usage will remain low. Owing to its exposure to the vagaries of the mining industry, and because of a swiftly shrinking population, similar to other rural centres, and compounded by its isolation, Broken Hill has encouraged its widespread artistic credentials and is promoting itself as a tourism destination in order to become less reliant upon mining as a source of employment. The town is served by the local newspaper, the Barrier Daily Truth. 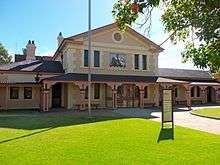 Major metropolitan and national newspapers from Adelaide, Sydney and Melbourne are also available in Broken Hill. The following television channels are available free-to-air in the Broken Hill region. ABC which broadcasts the ABC1, ABC2, ABC3 and ABC News 24 channels. SBS broadcasting the SBS ONE and SBS Two channels. Eleven (first digital multichannel ever launched in Broken Hill). Although Broken Hill is in New South Wales, the programming schedules for these channels is the same as those of Nine, Ten and Seven in Adelaide, with local adverts inserted and some variations for coverage of Australian Football League or National Rugby League matches, local and national news and current affairs programs, some lifestyle and light entertainment shows and infomercials. This is because Broken Hill, unlike the rest of New South Wales, is on Central Time. Southern Cross GTS/BKN broadcasts Seven Network programming including AFL telecasts and other sporting and major events. Southern Cross Ten broadcasts Network Ten output and some programming from ONE HD. On 31 October 2010, Southern Cross GTS/BKN commenced broadcasting a full-time Channel Nine station available in digital broadcast format only. This service will initially be a relay of TCN Sydney, with local advertising inserted. Analogue television transmissions were turned off and discontinued on 15 December 2010 as part of the federal government's national digital TV switchover scheme. The Southern Cross Central service (unrelated to the original Central GTS/BKN) and Imparja Television are available via satellite and terrestrial transmission in the adjacent areas. 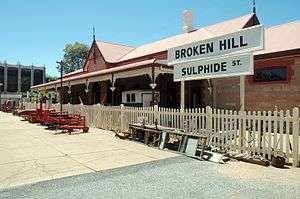 Broken Hill was featured during the second leg of The Amazing Race: Unfinished Business. 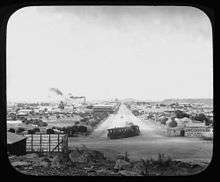 Health effects related to the mining industry were endemic to Broken Hill for many years. In 1895, as many as 1 in 50 miners were estimated to be affected by lead poisoning. As recently as 1991, over 80% of children under 5 years of age had blood lead levels higher than government guidelines. In the early 1990s an extensive government funded Lead Education program was established and people with children under 5 were able to have free lead testing of their children, homes and gardens to assess lead contamination levels. Any property that had considerably high lead levels in ceiling dust or garden soil was provided with free remediation works to reduce potential exposure to lead dust. Lead contamination continues to be one of the most serious health concerns, particularly in children in Broken Hill. Streets located next to the major mine, including Gaffney, Eyre, and Slag Streets have the unenviable award of being classified as some of the most contaminated residential streets in NSW. ↑ "Profile of the electoral division of Parkes (NSW)". Australian Electoral Commission. 25 February 2016. Retrieved 12 July 2016. ↑ "Broken Hill". Destination NSW. Retrieved 17 June 2013. ↑ "Broken Hill Solar Plant". AGL. Retrieved 19 April 2016. ↑ "How Broken Hill became a solar power trailblazer". The Sydney Morning Herald. 22 December 2015. Retrieved 19 April 2015. ↑ http://handle.slv.vic.gov.au/10381/86576 |Sturt 1844-1944 : Souvenir of the Sturt Centenary, 1844-1944. Barrier Field Naturalists' Club. 1 2 3 "History." Broken Hill: Accessible Outback. 2007, Edition 15, p4. ↑ "PLACE NAMES.". The Australian Women's Weekly. National Library of Australia. 13 May 1964. p. 61. Retrieved 22 February 2011. ↑ "Description and crystal structure of nyholmite, a new mineral related to hureaulite, from Broken Hill, New South Wales, Australia". Retrieved 3 February 2010. ↑ Nasa, gov. "Antarctic ice cores". Retrieved 3 August 2014. ↑ "Silverton". The Sydney Morning Herald. 8 February 2004. Retrieved 17 December 2007. ↑ "Operations: Worldwide Perilya Operations Map". ↑ "Battle of Broken Hill: Ron visits this Outback area of New South Wales". Retrieved 25 July 2008. ↑ "Of Art and War on Broken Hill". Retrieved 25 July 2008. ↑ "Battle of Broken Hill". Retrieved 16 November 2006. ↑ "A History of Rail in South Australia". National Railway Museum Port Adelaide. Archived from the original on 23 March 2008. Retrieved 5 March 2008. ↑ "Silverton Tramway Company Ltd". NSW Parliament. Retrieved 5 March 2008. ↑ "Tarrawingee Line". Retrieved 22 October 2006. ↑ "Indian Pacific timetable". Great Southern Rail. 2 August 2015. ↑ "Western timetable" (PDF). NSW Trainlink. 20 October 2013 [Updated 15 June 2013]. 1 2 3 4 5 Pigram, John J. (2007). Australia's Water Resources: From use to management. Collingwood, Victoria: CSIRO Publishing. pp. 56–68. ISBN 978-0-643-09442-0. Retrieved 18 May 2014. ↑ "Climate statistics for Broken Hill". Australian Bureau of Meteorology. Retrieved 12 February 2009. ↑ "NSW Department of Health Broken Hill Review 2004" (PDF). Retrieved 7 March 2006. ↑ Digital TV Switchover Australia: Rollout map Additional digital only channels such as 7Two, 7mate, GO!, GEM and One HD are expected to commence transmission in 2011 after additional frequency spectrum is allocated following the analogue transmission shutdown. ↑ Galvin, Peter (12 June 2009). "The Making of Wake in Fright (Part Two)", SBS. Retrieved 15 January 2013. ↑ "Graham Shirley 'The Outback on Screen' on australianscreen online". Retrieved 23 October 2012. ↑ "Broken Hill Time Capsule on nfsa.gov.au". Retrieved 23 October 2012. ↑ Back, Alexandra (May 19, 2015). "The salt and peppered history of cheese slaw". ABC Broken Hill. Retrieved September 11, 2016. ↑ "Broken Hill becomes first Australian city to join National Heritage List after decade-long campaign". Australian Broadcasting Corporation. 20 January 2015. Retrieved 20 January 2015. ↑ "National Heritage Places – City of Broken Hill". Department of the Environment. Retrieved 20 January 2015. ↑ Balding, Bill. "Lead and Environmental Health in Broken Hill" (PDF). CSIRO. Retrieved 6 February 2012. ↑ "Athletes at the 1996 Atlanta Paralympics: Wheelchair Basketballers". Australian Sports Commission. Archived from the original on 20 January 2000. Retrieved 18 May 2014. ↑ "Pro Hart on the National Film and Sound Archive of Australia's australianscreen online". Retrieved 23 October 2012. ↑ Strahan, Frank (2000). "Australian Dictionary of Biography". Mawby, Sir Maurice Alan Edgar. Australian Dictionary of Biography. Retrieved 2015-03-30. 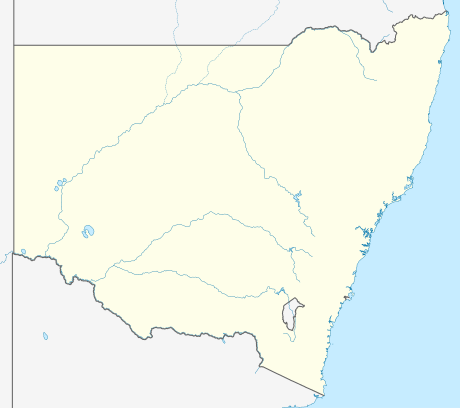 Wikimedia Commons has media related to Broken Hill, New South Wales. Watch historical footage of Broken Hill dating from 1926–1994 from the National Film and Sound Archive of Australia's collection.